Benacof ® is a preparation of Diphenhydramine Hydrochloride. Categories: Brands, cold and flu. Tag: cold and flu. Each 5 ml syrup contains Diphenhydramine Hydrochloride, Celluloses, dicalcium phosphate, polysorbate, starch, stearic acid, titanium dioxide, . Benacof ® is a preparation of Diphenhydramine Hydrochloride. It is a well absorbed antihistamine and widely distributed throughout the body, including the CNS. It is principally used as a potent antihistaminic, antitussive, antiemetic, antiparkinsonian agent. 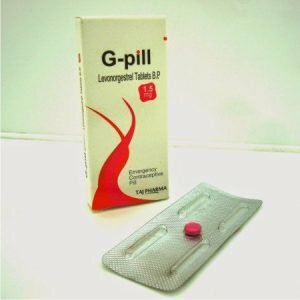 This medicine is available without a prescription; however, your doctor may have special instructions on the proper use of this medicine for your medical condition. Most allergic conditions are controlled with 25 to 50 mg i.e. 3 to 4 times a day. Children 6 to 12 years of age: 10 mg i.e., (5 ml of syrup) 3 to 4 times a day. Children 1 to 6 years of age: 5 mg i.e., (2.5 ml of syrup) 3 to 4 times a day. Adults: 25 mg every 4 hrs. Not to exceed 150 mg in 24 hours. Children (6 to 12years): 12.5 mg every 4 hours. Not to exceed 75 mg in 24 hours. Children (2 to 6 years): 6.25 mg every 4 hours. Not to exceed 25 mg in 24 hours. Diphenhydramine Hydrochloride is contraindicated for the premature or newborn infants. Any patients in whom drowsiness is undesirable e.g. drivers, machine operators. Concomitant consumption of alcohol or central nervous system (CNS) depressants will potentiate drowsiness. Patients with known hypersensitivity to Diphenhydramine or any components of the product. Patients should be cautioned not to operate vehicles or hazardous machinery until their response to the drug has been determined. Diphenhydramine hydrochloride administration significantly reduces the absorption of the antituberculous agent para-aminosalicylic acid (PAS) from the gastrointestinal tract. It has also additive effects with alcohol and other CNS depressants (hypnotics, sedatives, tranquilizers, etc). MAO inhibitors prolong and intensify the anticholinergic (drying) effects of antihistamines. Antihistamine over dosage reactions may vary from central nervous system depression to stimulation. Stimulation is particularly likely in children. Atropine like signs and symptoms such as dryness of mouth, fixed and dilated pupils, flushing and gastrointestinal symptoms may also occur. Side effects include drowsiness, dizziness, dryness of mouth, blurred vision, nausea and vomiting. There are no adequate and well-controlled studies in pregnant women using diphenhydramine hydrochloride. Therefore, diphenhydramine hydrochloride should be used in pregnancy only if clearly needed. Diphenhydramine hydrochloride has been reported to be excreted in breast milk and thus, use of diphenhydramine hydrochloride in lactating mother is not recommended. Store at a cool and dry place, away from light. Keep out of the reach of children. 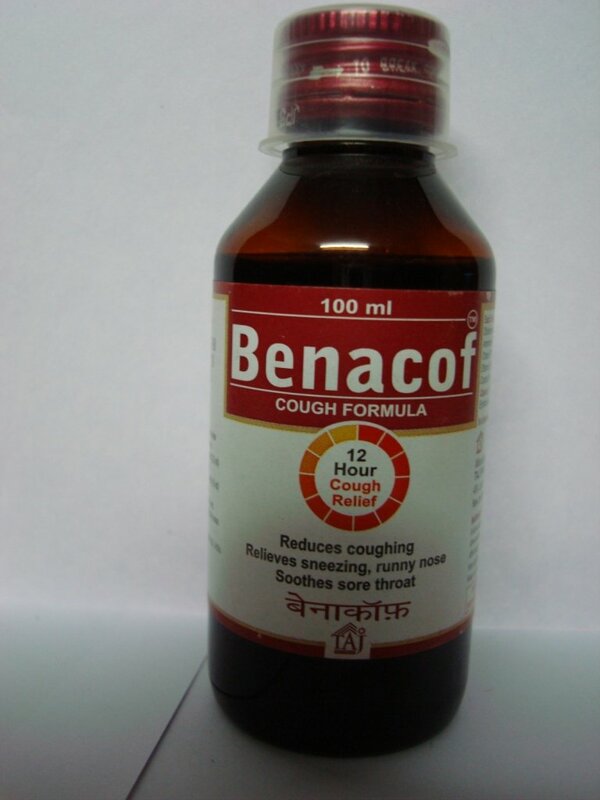 BENACOF® – Taj Dearob Pharma | Each 5 ml syrup contains Diphenhydramine Hydrochloride, Celluloses, dicalcium phosphate, polysorbate, starch, stearic acid, titanium dioxide. 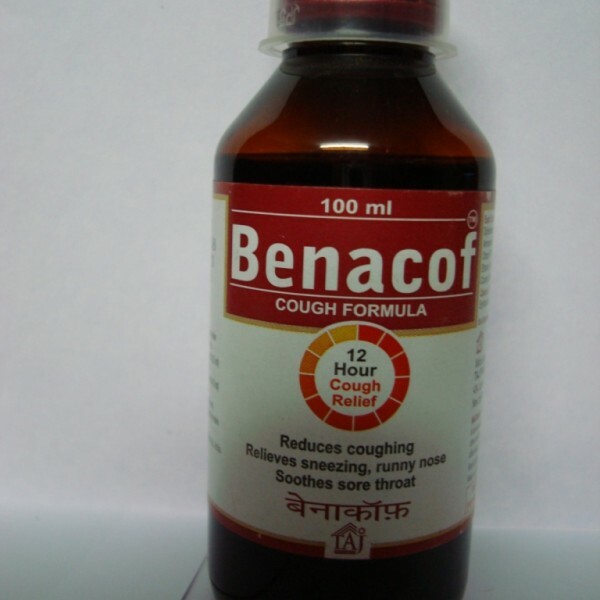 BENACOF® – Taj Dearob Pharma | Each 5 ml syrup contains Diphenhydramine Hydrochloride, Celluloses, dicalcium phosphate, polysorbate, starch, stearic acid, titanium dioxide.